One of my favorite tattoos that I’ve done was on a very mature, 18 year old Livingston County girl that my wife watched grow up. Violet is the daughter of my wife’s friend from a job she’s held off and on for about a decade. Violet started asking me questions about my style of tattooing. She asked if I was skilled at photo realism. I told her it was my preference and asked her what she had in mind. 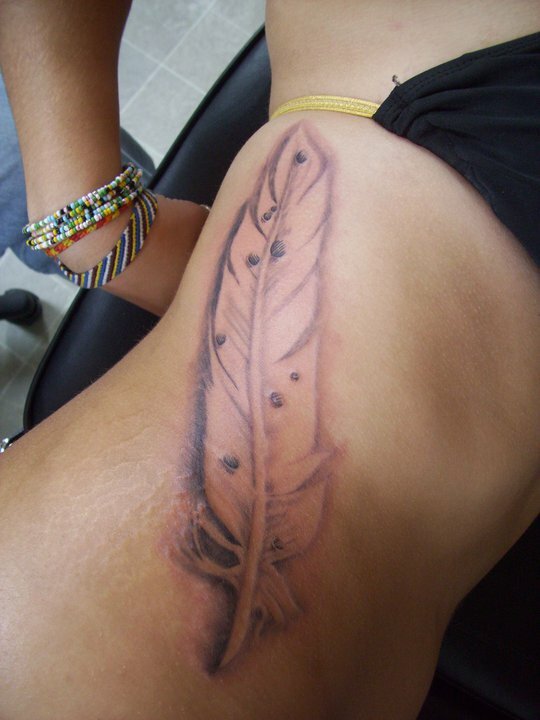 She had been searching around for an artist that could handle a very delicate design of a feather with water droplets. She said she thought about her design for quite some time and decided exactly what she wanted. In a profession where young girls come into the shop on a daily basis saying, “I want a tattoo, what should I get…” Violet’s insistence on sticking with her chosen design and actually searching around for an artist that is right for the job was absolutely refreshing. When getting a tattoo, I prefer people to know what they want. It’s perfectly find if they don’t know exactly what they want. I can help a client come up with a design, even if they simply know what emotion they’d like to convey or what memory they’d like to represent. These tattoos are always so much more meaningful to the client, and so consequently, they mean more to me. They bring more satisfaction are less likely to result in regret a couple of years down the road. Think about what you want first. Price checking should never be a huge concern. Most of us regularly give discounts and run specials. What should be a huge concern is looking at the artist’s portfolio, getting a feel for their style, figuring out what design is perfect for you, and thinking about the placement and size. Violet demonstrated quite a bit of wisdom, realizing that someday, she would likely have children. She chose a place on her side that was less likely to be altered by the physical changes of motherhood. I will point this out to young girls, but often it doesn’t seem to matter. One day though, it certainly will.